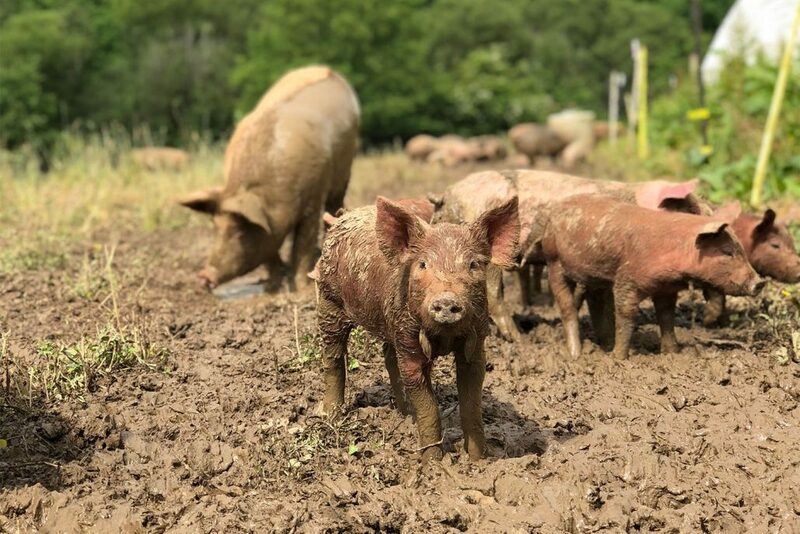 You are here: Home / Blog / Pastured Pork / What Does Pigs on Pasture Mean? What Does Pigs on Pasture Mean? Flowers are blooming, trees are budding, the weather is warming… but more than anything else, the sign that indicates spring’s arrival is that we finally moved our pigs out of the barn and onto pasture! There is a long tradition of herding animals in this area. The old Drover’s Road comes right through the farm. Farmers from the West drove their mules, pigs, turkeys, and cows to eastern markets along what is now 74-A. The house that my great grandparents bought when they moved to Fairview in 1916 was actually an old Inn. Fairview is about a day’s walk from the city, perfectly situated for the drovers who were pushing their way east. One thing I will say about days spent herding pigs: It’s not easy. I have so much respect for those farmers who were driving their animals hundreds of miles. We only herd our pigs several hundred yards. We set up fences and gates to keep them from taking off wherever they please. We make sure to have people ready to block off routes that look enticing. And, even with all those precautions in place, we have plenty of disasters. Pigs are smart. Once they learn a fence line (especially an electric line where they’ve experienced a good shock) they are loathe to cross it. Our herd has been in the barn all winter, enjoying deep bedded warmth in a small and well defined area. The most difficult part of herding them to new pasture is getting them out of the barn. They know their space, they have rooted right to the edge of the fence line and made the contours their own. When we take the fence down, they can still see the line where their rooting stops. They know from experience that they shouldn’t cross that line. One trick we learned that helps us get the herd over that mark is to spread fresh hay on either side. This disguises the line and the pigs also like to root in it, searching for food or anything else exciting (pigs find a lot of mundane things exciting… bits of wood, rubber, metal, basically anything they can gnaw on). Once they’ve crossed the threshold, they are perfectly willing to go as far as their chubby legs can carry them. It feels great to see the pigs out in the pasture, happily rooting through dirt and grass, stretching their legs in the wide open space. I also like joining in the tradition of the drovers. I am glad that our route only takes us down the road a little ways and not over mountains and across hundreds of miles of rugged terrain. Hats off to the drovers. They must have known their animals well by the end of a trip like that. https://www.hickorynutgap.com/wp-content/uploads/2019/02/happy-piglet.jpg 1000 1500 Kelsey Winterbottom https://www.hickorynutgap.com/wp-content/uploads/2019/03/Hickory-Nut-Gap-Meats-Logo.png Kelsey Winterbottom2014-03-21 19:22:162019-02-28 17:14:39What Does Pigs on Pasture Mean? Go on, eat that bacon.